Prepare your employees for the next steps in their ORM career. 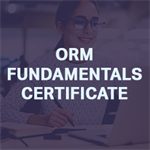 The Operational Risk Management (ORM) Fundamentals Certificate was developed under the guidance of RMA’s Operational Risk Council. 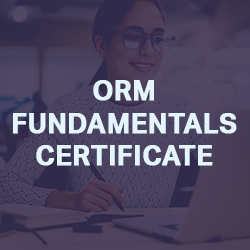 It was created to validate an institution’s entry-level ORM training program and/or identify any gaps in training, which may be bridged through one or more of RMA’s operational risk Web seminars. The certificate is intended for individuals who are new to the operational risk discipline to demonstrate that they have a solid foundational knowledge of key principles in the practice area. To earn the certificate, individuals may take an online, 30-question exam at any time they choose. Institutions may sponsor a group of people to take the exam. For you, the individual, passage of the exam and awarding of the certificate confirms that you have a solid understanding of general operational risk concepts. For the institution, the exam can be used to validate its entry-level training program and/or identify any gaps in training, which may be bridged through one or more of RMA’s operational risk Web seminars. $300 for individuals employed by nonmembers. Individuals who do not pass the exam on the first try, can retake the exam one (1) time at no additional charge at any time within 180 days. Individuals who fail to pass the exam twice must re-register and pay an additional $75 fee, which allows individuals two more opportunities to pass the exam. Important: You must complete the entire exam in one sitting. You cannot ‘X’ out or leave the page. An individual will receive his or her score immediately upon completion of the exam. The results become official upon the individual’s receipt of the Certificate, which will be sent by RMA via mail following successful completion of the exam. Passage of the exam and awarding of the certificate confirms that your employee has a solid understanding of general Operational risk concepts. For more information, please contact Ed DeMarco, Director of Operational Risk or Sylwia Czajkowska, Associate Director, Operational Risk.